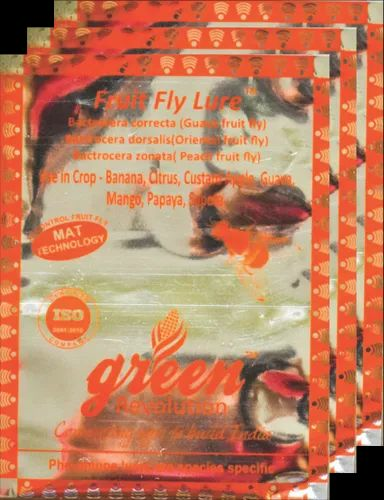 With immense market knowledge, we have been able to provide optimum quality Oriental Fruit Fly Lure. Apricot, Banana, Citrus, Guava, Mango, Papaya, Peach, Pear, Pineapple, Sapota, Tomato. The color of the fly is highly variable but mostly yellow with dark markings on the thorax and abdomen. Generally, the abdomen has two horizontal black stripes and a longitudinal median stripe extending from the base of the third segment to the apex of the abdomen. These markings may form a "T" shaped pattern, but the pattern varies considerably. Eggs of B. dorsal are laid below the skin of the host fruit. These hatch within 1-3 days and the larvae feed for another 9-35 days. Females begin to lay eggs about 8 days after emergence from the puparium. Under optimum conditions, a female can lay more than 3,000 eggs during her lifetime, but under field conditions, approximately 1,200 to 1,500 eggs per female are considered to be the usual production. Ripe fruit is preferred for egg laying, but immature ones may be also attacked. Larval feeding in fruits is the most damaging. Damage usually consists of the breakdown of tissues and internal rotting associated with maggot infestation, but this varies with the type of fruit attacked. Infested young fruit becomes distorted, callused and usually drop; mature attacked fruits develop a water-soaked appearance. The larval tunnels provide entry points for bacteria and fungi that cause the fruit to rot. When only a few larvae develop, damage consists of an unsightly appearance and reduced marketability because of the egg laying punctures or tissue breakdown due to the decay. Methyl eugenol is used to lure males and it is very effective in monitoring these fruit flies. It attracts flies over a range of up to 1 km. The lure is placed in the trap along with malathion/DDVP soaked in small cotton wicks they are suspended in the middle of the trap to release the scent slowly into the atmosphere to attract and trap the fruit flies. Packaging Details EACH PACK 50 UNIT/ PER BOX 20 PACKET.